What if I had invested near the stock market peak? 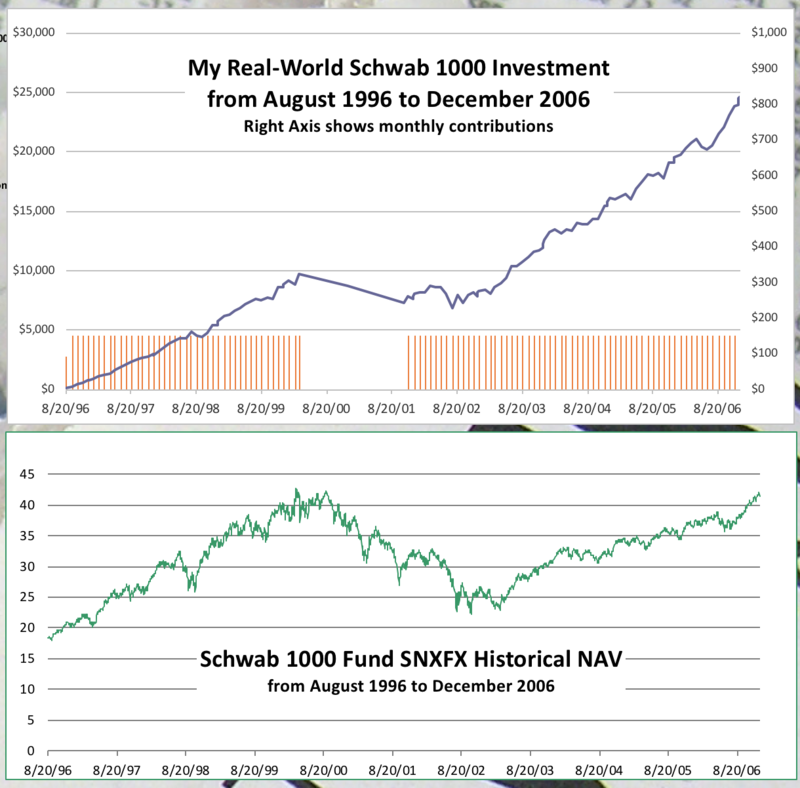 Last week, I shared results of my 10-year investing experience with a broad market index fund: My 10-year odyssey with a Schwab index fund. This post follows up on that theme by simulating several related scenarios. None of them I experienced myself but they’re still useful to gain insights from. First, a quick recap of that 10-year journey. I started buying shares of an index fund every month (with fixed dollar amount) in 1996 and continued uninterrupted (mostly, but with one exception) until the end of 2006. During that time, I invested a total of $15,841 in that fund. 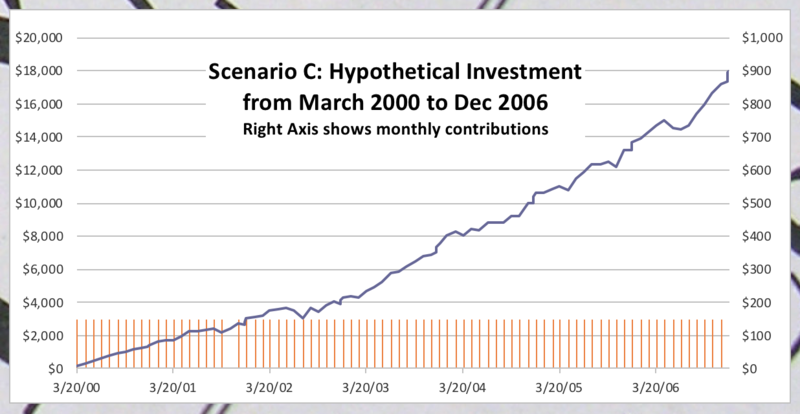 Market value of my investment at the end of 2006 was $24,567 — resulting in an annualized rate of return of 8.4% (calculated as internal rate of return or IRR). 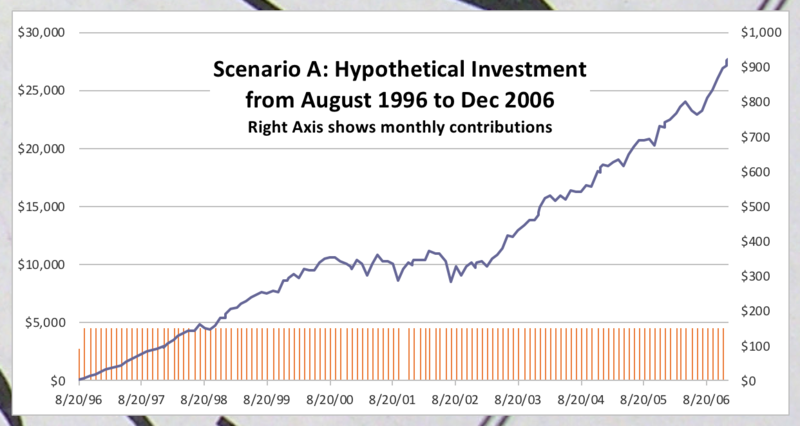 Scenario A: You can see from the chart that I had stopped putting in new money for 18 months beginning in April 2000. I explained my reasons in the last week’s post. 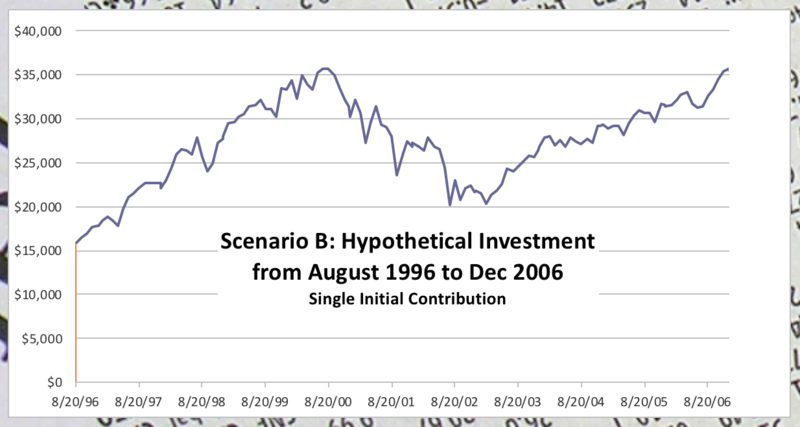 But what if I had continued investing uninterrupted in the index fund throughout the entire 10-year period? This is of course a hypothetical scenario. Using historical share prices of Schwab 1000 Fund (SNXFX), I ran the numbers. If I had done that, I’d have about $2,700 more and could have gained an additional $400. In this case, my rate of return would have been 7.57%. The reason for somewhat lower return can be attributed to my near-perfect market timing. I had inadvertently managed to stop investing just at the time when the prices were high. In reality though, it wouldn’t have hurt me at all had I kept on investing throughout. I’d have made more money. 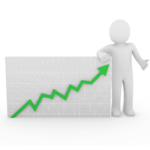 Generally speaking, I don’t try to time the market and change my investing pattern frequently. I prefer simple rule-based investing that works over long periods of time and keeps emotions and intuition out of it: Be mechanical about your investing approach. In April 2000, I had a somewhat lucky break. I don’t believe I knew then that the market was near its peak valuation. Still, as this scenario showed, I would have been just fine without that break too. Scenario B: I ended up investing $15,841 in SNXFX over those ten years. But what if I had all this cash available at the beginning of that period (in August 1996) and had bought SNXFX shares all at once. In that scenario, I’d have much higher capital gain – about $19,800 in total. But my rate of return would still be slightly lower than in my real-world return. Why higher gain but less overall return rate? The gain in dollar terms would have been higher in this case because I’d have invested all the money upfront. This is unlike dollar cost averaging where I had spread investing over the decade. However, this would also be a highly unrealistic scenario for most young investors like I was at the time. I didn’t have all that money saved up to invest at once. Even if I had the cash, I probably wouldn’t have courage to invest it all at once in the stock market. That last point is worth expanding on. Even if I had a tidy sum saved up in a savings account somewhere, I am likely not ready to go all in with stocks. Most other people won’t either. It’s just too hard to prepare yourself mentally for stock market’s daily fluctuations. I would be constantly second guessing myself if it were a mistake to invest a large sum all at once. What if the market goes down from here and not recover for a few years? This question brings us to our next scenario. Scenario C: This is the most interesting of the three hypothetical scenarios I ran. Imagine if I had started this dollar-cost averaging campaign in March 2000 when the stock market was at its bull market peak. One might be tempted to think that it would have been a real bad time to start investing. We were at the market high that was never achieved before. And we won’t again get back to this level for another six years. Sounds like a pretty bad time to start investing, doesn’t it? Not so! Take another look at the numbers in the table. My rate of return (11.56%) would’ve been much higher. Higher than my actual return (8.40%) when I started in 1996. Higher than any other scenario we’ve considered here. Why my rate of return would’ve been better if I had started investing at the stock market peak in March 2000? It’s because I had new money coming in every month to purchase fund shares. As the stock market kept sliding, my $150 would’ve bought more and more SNXFX shares each month. From the year 2000 to 2006, the market stayed below the level I started out at. And when it finally returned to its previous high in 2006, all those cheaply bought shares of SNXFX made good profits. And don’t forget that I was also reinvesting dividends and capital gain distributions. For a consistent steady investor, just about the best thing he can hope for is a market drop early in his investing career. One might ask what happens if the market declines and never recovers. The quick answer is that it does not happen. Stock prices ultimately represent real business earnings. As long as the economy grows and businesses earn profits, stocks will move up too — albeit in fits and starts. For evidence, see the relentless rise in U.S. GDP in this post. What if we suspend disbelief for a moment and imagine a scenario where stocks crash and never recover? A well-respected fellow blogger ran numbers on this scenario here: Why a 66% crash would be better than a 200% melt-up. He simulated two scenarios for an investor who has 30 years to save and invest. In one scenario, the stock market’s valuation rose three times immediately after he started investing. In the other scenario, the market valuation declined to one-third. Guess which scenario made more money for the investor? The one with 1/3rd market decline. It goes against our intuition, but it is true. The numbers don’t lie. You can check them out in the link above. Granted that those two scenarios were extreme and far from reality. Still, as I showed with my own real-world numbers, a stock market decline can be a good thing for an investor. Long-term patient investors who have ten or more years to invest ought to wish for a bear market or two in their investing journeys. Market declines should be welcomed. They are our best opportunities to make money. In a previous blog post Revisiting U.S. stock market’s lost decade, I ran the numbers and showed how that so-called lost decade (2000 to 2012) of the US stock market was in reality quite profitable for investors who were on an auto-invest regime. A short quiz: If you plan to eat hamburgers throughout your life and are not a cattle producer, should you wish for higher or lower prices for beef? Likewise, if you are going to buy a car from time to time but are not an auto manufacturer, should you prefer higher or lower car prices? These questions, of course, answer themselves.